Put a head of cabbage in a pot of boiling water, and peel off the cabbage leaves one at a time. Cut off the rough part on the end of the cabbage leaf with a sharp knife. 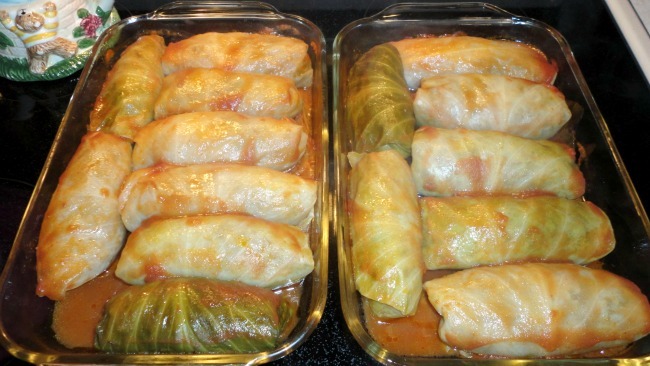 Mix all ingredients together except the 15 oz can of tomato sauce and crushed tomatoes and put a small amount (size of a sausage) on a cabbage leaf, and roll up like a fajita and place seam side down in a casserole dish. 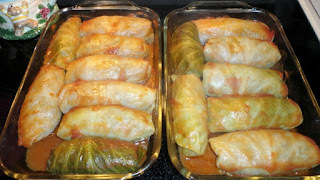 I put tomato sauce and a cabbage leaf or 2 on the bottom of the casserole dish so the Halupky won't burn. Pour crushed tomatoes over Halupkys. Cover and bake approximately 75 minutes at 375º. Turn oven down to 325º and bake for approximately 90 more minutes until cabbage is tender. Baste every hour.